Based on a sample of 20,000 credit scores, our data shows that there is a difference of average scores based on what email service users prefer. 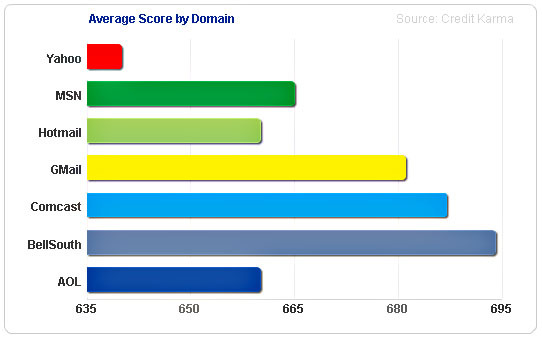 Interestingly, Gmail and Comcast users came out the top with a higher average, while AOL and Yahoo users had the lowest average credit scores. Hah! Stupid Yahoo users do poorly! But — southerners seem to do well! Snooty Gmail users aren’t as great as they think! Etc. I’ll bet David Brooks could squeeze an entire column out of this.